Marked 2 lets you choose from a menu of alternative CSS templates, and exports to a range of formats, as well as printing directly. 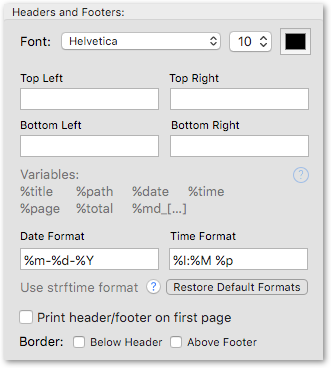 if Marked 2 is installed and running on your system, displays a preview, allowing you to choose a CSS template and print or export. // adjusted indents for tasks and notes. // blank line between a task and its note text ? 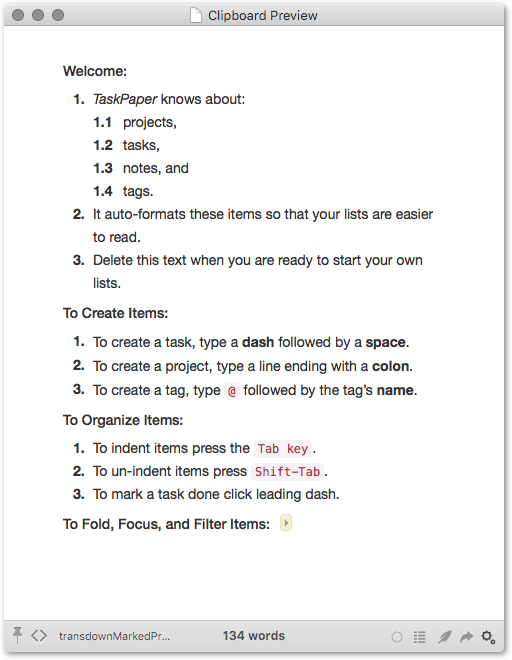 // 1|0 blank line between a task and its note text ? 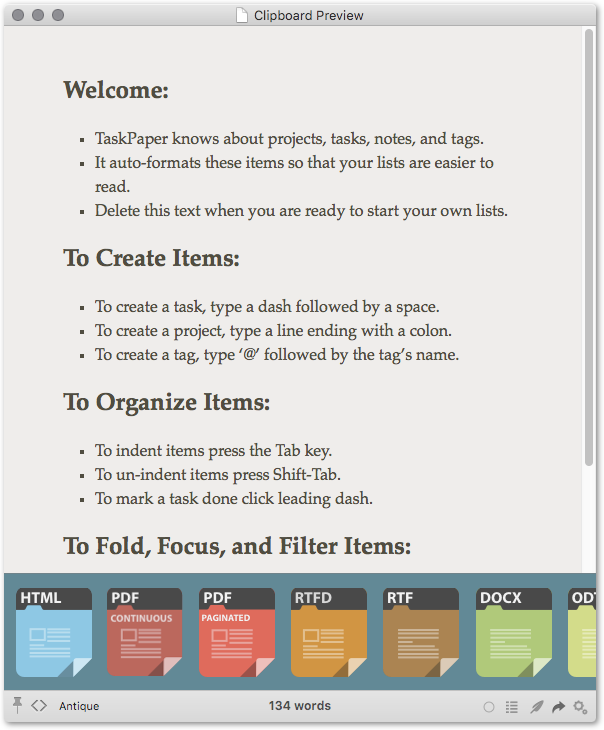 Adapt (the automatically generated) header and footer text? 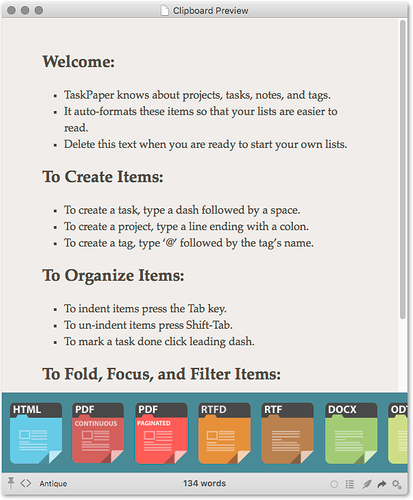 noteGap: true, // blank line between a task and its note text ? it is very slow in processing - and it tends to hang when it encounters an @search on my machine. I am running the latest (production) release of both. On speed, the script itself should execute fast. Marked 2’s webkit technology needs a good amount of resource (it essentially contains a browser) so make sure that RAM is not full of many other programs. 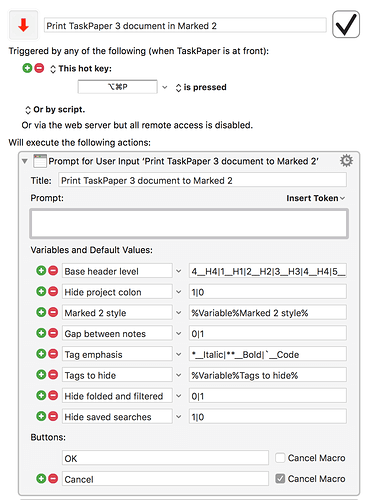 The script will then simply generate a MultiMarkdown version of the TaskPaper document, and I think you should find that it does that fairly fast. (If not, you could look in the Console.app logs for anything unusual, and let us know what hardware and OS X version you are using. If the bottleneck appears to be in Marked 2, you could ask for advice on the Marked 2 support forum). I can’t seem to get this to work either. 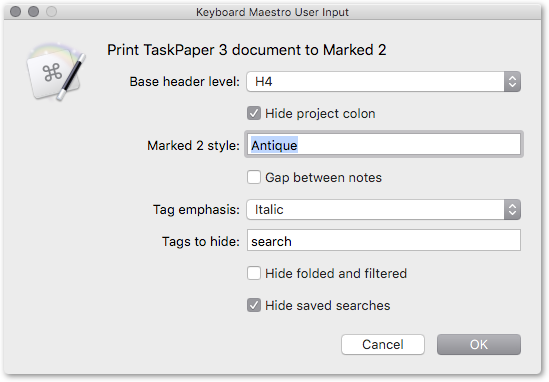 I’m running TaskPaper v3.2 (200) on Mac OS X 10.11.4 (15E65) using Keyboard Maestro v7.1. When I try to run this nothing happens & I don’t see anything related in my console. Any thoughts? Tried all of your suggestions, but still no luck. Variables are created tho. 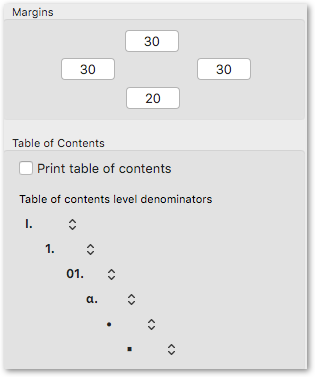 Is the KM dialog displaying ? If you check that you have copied every line of the source script (not always easy and run in Script Editor, what does it now do, with the KM variables in place. 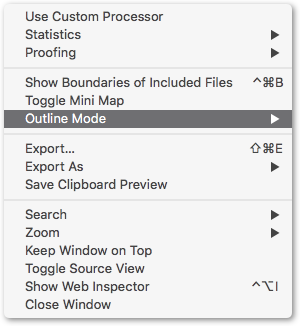 No, KM dialog is not displaying & the clipboard content is not changing. You are running this KM macro and the dialog is not showing ? Hmmm…I’m stumped. Yeah, that’s the macro I’m running. What’s weird is I use KM macros like 300 times a day and have some pretty complex ones too, so this one shouldn’t be any different. Are you running KM 7? Also, does Marked need to be open? Just killed the KM engine & restarted it and the dialog box is now showing up & everything is working just fine! Should’ve tried that first. Thanks for your help! Doh! Can’t get this to work either. The resultant text won’t parse with any of my markdown editors. It places the text on the clipboard, but Marked 2 just shows a window loading and never actually loads. I’ve tried pasting the text in a text document and opening it, but Marked 2, ia writer and multimarkdown composer all crash when trying to load the document. 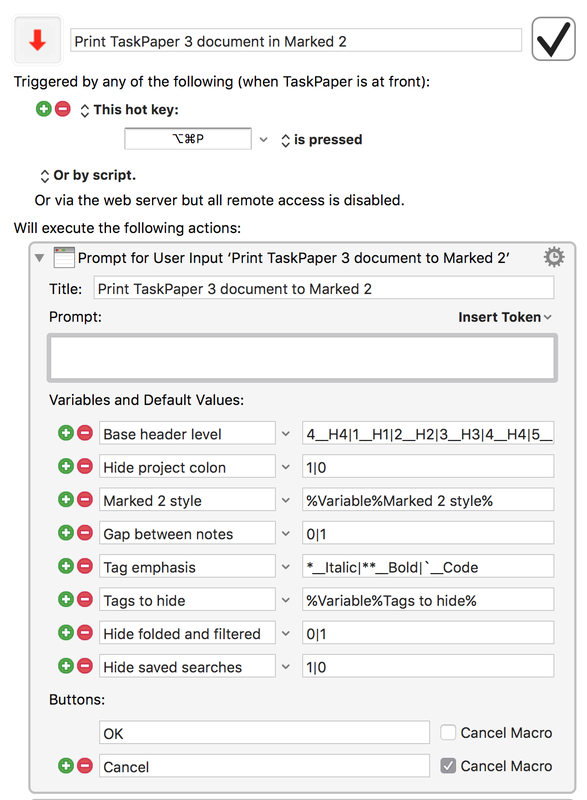 If you are still having difficulties, and your versions are the same as these, perhaps you could send me, through forum mail, the simplest TaskPaper 3 file (input and clipboard output) that you are seeing this with, together with any error messages (e.g. in Console.app).